a solid mass of cells (blastomeres) resembling a mulberry, formed by cleavage of a zygote (fertilized ovum). The solid mass of blastomeres resulting from the early cleavage divisions of the zygote. In oocytes with little yolk, the morula is a spheroid mass of cells; in forms with considerable yolk, the configuration of the morula stage is greatly modified. 1. the solid mass of blastomeres formed by cleavage of a zygote. 2. an inclusion body seen in circulating leukocytes in ehrlichiosis. The spherical embryonic mass of blastomeres formed before the blastula and resulting from cleavage of the fertilized ovum. a solid, spherical mass of cells resulting from the cleavage of the fertilized ovum in the early stages of embryonic development. It represents an intermediate stage between the zygote and the blastocyst and consists of blastomeres that are uniform in size, shape, and physiological capabilities. morular, adj. An early stage of embryonic development characterised by a solid ball of about 32 primitive cells. The solid mass of blastomeres resulting from the early cleavage divisions of the zygote. An early stage in the development of the embryo at which it consists of a solid spherical ball of apparently identical cells. 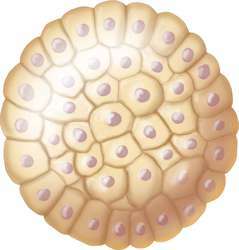 a solid ball of cells resulting from cleavage of a fertilized ovum. It is formed of a mass of BLASTOMERES which subsequently form a BLASTULA. 1. a solid mass of cells (blastomeres) resembling a mulberry, formed by cleavage of a fertilized ovum. 2. a cluster of organisms appearing as an inclusion in the cytoplasm of circulating leukocytes infected by Ehrlichia spp. Specimens of Morula granulata were collected from Manora Channel. Morula cells and histocompatibility in the colonial ascidian Botryllus schlosseri. Dado que ninguno de los embriones cultivados en MC alcanzo el estado de morula o blastocisto no se efectuaron transferencias de embriones cultivados en dicho medio. The results indicate that these immunoreactive molecules are mainly detectable in stimulated morula cells, suggesting that these cells have a role in immunomodulation. of to] to] to] Blastocyst (192) Glucose oocytes 2-cell 8-cell Morula (mM) cultured (48) (96) (144) Total Hatching 10 54 83. Thus, 18 h after fertilization, embryos treated with SNAP prior to the morula stage had not progressed beyond the blastula stage. b) of embryos developed to Medium 8-cell Morula Blastocyst CZB 1 (2) (c) 0 (0) (c) 0 (0) CR1aa 16 (18) (d) 5 (5) (d) 1 (1) Fusion was induced with two DC pulses of 1. Morula cell infiltration, which occurs in allorejection in most botryllid species, might be facilitated by the change of permeability in the ampullar epithelium (Taneda and Watanabe, 1982a). We found that BOEC co-culture system improved significantly the development rates beyond morula stages when embryos were cultured in PCC. In this rejection, infiltrating blood cells - mainly eosinophilic morula cells - aggregate and disintegrate in the tunic at the subcuticular region; thus the lesion is also well stained by eosin. The morphologic variations of plasma cells noted were flame cells, multinuclearity, morula cells and Dutcher body (Table 1). Phagocytes include hyaline amebocytes and macrophage-like cells, while cytotoxic cells include granular amebocytes and morula cells.